It’s a gray day here at God’s Whisper. The sky is painted shut with clouds the color that a white crayon makes on off-white paper. The day feels close, present, big. In this moment, it feels a bit like words are sitting on the other side of those clouds from me, tiny, fat cherubs with wings and harps. 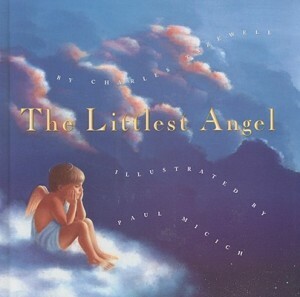 (The Littlest Angel, one of my favorite children’s Christmas books comes to mind.) It’s like they’re on a break. Relaxing in the heavenly spheres. Napping. Playing music. Eating marshmallow fluff with their adorable, stubby fingers. Meanwhile, here on earth where there is a sheen of dirt on most things, I find myself open-mouthed and gaping, a bass pulled out of her water. I’ve let the words go for this time – giving myself space to focus on other things – but still, I miss them. They are the way I breathe. So I sit for these few moments under this mild, gray sky, and I wave to my words as they peek those rosy, round cheeks through the clouds. They are just waiting for me. When I call, they will come. They always do. Winging their way to me with their sticky fingers. When you think of your words today, what image comes to mind?